Two of the Civil War's most colorful cavalry officers butted heads at Buckland Mills, Virginia: J.E.B. Stuart and Judson 'Kill Cavalry' Kilpatrick. For the Federal government at Washington, D.C., the news from Tennessee was grim in late September 1863. The Union Army of the Cumberland, under Maj. Gen. William S. Rosecrans, had been surprised and defeated at the Battle of Chickamauga and bottled up inside the city of Chattanooga, facing starvation and ultimate capitulation. Reacting to this severe and unexpected military setback, Abraham Lincoln on September 24 transferred part of the Army of the Potomac (about 20,000 men) by rail to aid the beleaguered Federals in southeast Tennessee. It was not until October 1 that General Robert E. Lee, commander of the Army of Northern Virginia, was able to confirm the suspected transfer of sizable enemy forces from Virginia to Tennessee. Eager to go back on the offensive after his shattering defeat at Gettysburg three months earlier, the Confederate leader was determined to do so even though his effective force of 46,000 men was greatly outnumbered by Maj. Gen. George G. Meade’s 85,000-man Army of the Potomac. By attacking, Lee hoped to prevent the transfer of additional Federal troops to the West and force another battle on his opponent at better advantage than the misbegotten three days at Gettysburg. If Lee was keen to move forward, his chief of cavalry, Maj. Gen. J.E.B. Stuart, was virtually obsessive about it. His controversial role in the Gettysburg campaign had seriously tarnished the “Bold Dragoon’s” reputation as an effective mounted commander. More and more, the opinion of the public, the government, and the army itself was that Stuart’s failure to provide adequate cavalry support during the battle was the root cause of the Confederate defeat at Gettysburg. Without saying it in so many words, Lee seemed to subscribe to the same viewpoint. He reorganized the army’s cavalry, expanding the mounted arm from a single division to a corps of two divisions under Maj. Gens. Wade Hampton and Fitzhugh Lee. Officially, the overhaul was said to promote efficiency by providing better command and control, but unofficially it was designed to reduce Stuart’s control by allowing senior cavalry officers such as Hampton and Lee to exercise more initiative during operations. The fact that Hampton and Lee were elevated to major general and Stuart was not made a lieutenant general—the normal rank for a corps commander—underscored the real reasons for the reorganization and the degree of disfavor into which Stuart had fallen. The politically canny Stuart, who had gloried in his nickname “the Beau Sabreur” since his famous “Ride Around McClellan” in 1862, was well aware of the real reasons for the changes to his command. He wanted to show to everyone—beginning with the revered Robert E. Lee—that he was not past his prime as a leader of men or a combat tactician. Stuart eagerly embraced Lee’s plan for an assault on Meade as a way to restore confidence in both himself and his troopers. Lee intended to advance from Madison Court House around his opponent’s right flank, gain his rear, and force Meade to attack the Confederates on ground of Lee’s choosing. The plan was essentially a rehash of the one Lee had attempted to carry out during the summer of the previous year. Then the Union Army of Virginia, under the boastful Maj. Gen. John Pope, had been positioned between the Rapidan and Rappahannock Rivers. On that occasion, the design was wrecked when Pope pulled back across the Rappahannock at the last minute to avoid Lee’s trap. Now Meade was in almost the same position that Pope had occupied. The Bristoe Station campaign began. While 7,000 Confederates (two infantry and three cavalry brigades) pinned down approximately 25,000 Union troops along the northern bank of the Rapidan, Lee hurled the rest of his army against the Federal right upstream. Leading the advance was Stuart, personally leading Hampton’s 2,500-man cavalry division. (Hampton was absent from the army recovering from injuries sustained during the Gettysburg campaign.) The rest of Stuart’s troopers, under Fitzhugh Lee, carried out a diversionary assignment along the south shore of the Rapidan. Fitz Lee, a nephew of the army chief, was a 37-year-old graduate of the United States Military Academy at West Point, class of 1856. After service on the Indian frontier after graduation, Lee had been appointed an assistant instructor of tactics at the academy. He joined the Confederate mounted arm in 1861, and by August 1863 he had advanced to the rank of major general. At Stuart’s side during almost every cavalry enterprise Stuart conducted, Lee was regarded as one of the best leaders of horse in the Army of Northern Virginia. His bravery, skill, and ability to act independently made him an outstanding battlefield officer. Stuart’s mission was twofold: to move ahead of the infantry columns of Lt. Gens. Richard S. Ewell and Ambrose P. Hill, screening their advance and keeping tabs on enemy strength, movements, and dispositions. Alert Federal scouting parties had detected Confederate preparations for just such a turning maneuver by October 7. In response, Meade had strengthened his northern flank with cavalry supported by infantry, a total of more than 9,000 men. The Confederate offensive commenced at dawn on a chilly October 10, with Stuart’s force marching northeast of Madison Court House. Facing Stuart during the first days of the campaign were Brig. Gen. H. Judson Kilpatrick and his 3rd Cavalry Division, which had been given the tasks of delaying the Rebel advance and discovering their true intentions. Kilpatrick was a 27-year-old native of New Jersey and graduate of the United States Military Academy, class of 1861. After beginning his service as an infantry officer, he moved to the cavalry branch in 1862 as lieutenant colonel of the 2nd New York Volunteer Cavalry Regiment. Kilpatrick participated in several successful mounted raids in northern Virginia and was instrumental in safeguarding the retreat of Pope’s defeated army after the Battle of Second Manassas. His pursuit of Lee’s retreating army after the Battle of Gettysburg was both vigorous and well conducted. 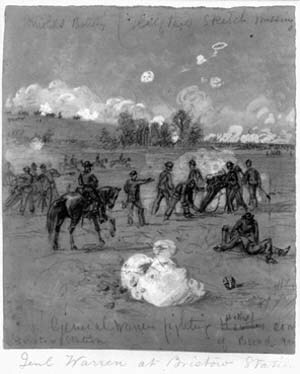 The initial Confederate advance fell on outposts manned by troops in Kilpatrick’s 1st Brigade under the command of Brig. Gen. Henry E. Davies. Educated at Harvard and Columbia, Davies at the commencement of the conflict had been practicing law in New York City. He had commanded the 2nd New York Volunteer Cavalry, and then on Kilpatrick’s recommendation had been given charge of 1st Brigade, 3rd Cavalry Division. When Davies was promoted to brigadier general, he was one of the few nonprofessional soldiers to obtain that rank in the Union cavalry corps. The former attorney was eager to prove his worth as a commander of horse soldiers and did so by mirroring his patron Kilpatrick’s careless, brash ways. Davies seemed capable enough when closely supervised by his superiors, but on his own he tended to act on impulse and not clearly evaluate situations—unfortunate traits for any military commander. After crossing Robertson’s River, Stuart’s men held the attention of the Union pickets of Davies’s brigade, supported by infantry, while more Confederate cavalry gained their rear, capturing 90 enemy soldiers and forcing Davies to retreat. The next day, Kilpatrick also retreated to the outskirts of Culpeper Court House, closely followed by Stuart. Meanwhile, the infantry of the Army of the Potomac fell back across the Rappahannock River. To the southeast, the Union 1st Cavalry Division, under the capable Brig. Gen. John Buford, moved to link up with Kilpatrick, closely followed by 12 mounted regiments under Fitzhugh Lee. Facing Kilpatrick’s 3,500 troopers with only 1,500 men, Stuart eschewed a frontal assault on his numerically superior opponent and instead raced hard to turn his enemy’s right flank in the vicinity of Fleetwood Heights, the scene of the climactic cavalry fight at Brandy Station on June 9. Quickly deducing Stuart’s purpose, Kilpatrick swung his regiments around to the rear and made for Fleetwood Heights. For the next 20 minutes, the commands of Stuart and Kilpatrick, in plain sight of each other, pounded up converging roads toward the same destination. Meanwhile, Fitz Lee directed his brigades to change direction and attempt to get behind Kilpatrick and cut him off from escaping across the Rappahannock River. Kilpatrick’s division approached Brandy Station, with the 2nd Brigade under Brig. Gen. George Armstrong Custer in the lead. The 23-year-old Custer was also a graduate of West Point, class of 1861. Although he had been the class goat, he had proven himself a brave and active staff officer and found favor with the commander of the army’s cavalry force, Maj. Gen. Alfred Pleasonton. On June 29, 1863, on Pleasonton’s recommendation, Custer had been promoted from brevet captain to brevet brigadier general, taking charge of the 2nd Brigade, also known as the Michigan Brigade because it comprised the 1st, 5th, 6th, and 7th Michigan Regiments. The elevation to brigade leader had seemed justified when Custer performed capably during the Gettysburg campaign and the numerous cavalry contests waged along the Rappahannock River during the subsequent summer and fall. Although he reveled in mounted saber charges, usually leading them himself, Custer also demonstrated unexpected skills in dismounted tactics, using his troopers’ seven-shot carbines and rifles to deadly effect. Exceedingly brave if oddly attired, Custer looked, said one bemused observer, “like a crazy circus rider.” Unlike Kilpatrick, however, he was also generally careful of his soldiers’ welfare. They, in return, idolized him. This article is from the December 2009 issue of Military Heritage Magazine. If you would like to read the rest of this and other articles, visit our order page to see which digital editions we have on offer. Tags Abraham Lincoln, Alfred Pleasonton, Army of Northern Virginia, Army of the Potomac, Battle of Gettysburg, Chickamauga, Confederate, J.E.B. Stuart, Judson Kilpatrick, Manassas, Office of Strategic Services (OSS), Rappahannock River, Robert E. Lee, Union Army, Wade Hampton, West Point military academy. Typo in 2nd para of the “Stuart in the Forefront” section. Fitzhugh Lee was 27 not 37.